American Retail Supply offers wide variety of Bulk Clothing Hangers - wooden, plastic, suit, pant and skirt, top hangers, & children. The quality is durable and offered in different sizes in bulk. Hangers are a great product to use to help organize your business. Different types of hangers are used for certain clothing items to reduce or stop the risk of causing damage to your items. Using the right hangers will display your items in the most enticing way. There is an old saying, "Use the right tool for the right job." The same could apply to hangers. A brief history, the shape came from the human shoulder and the first company to produce hangers in the U.S.A was Steinway & Co in the late 1800â€™s. Is your store in need of a store lift? Wooden Hangers are known for their high-end quality and are meant to evoke comfort, warmth and sophistication. Wooden hangers are used in a wide variety of stores, such as, men clothing, women's clothing, sporting goods stores and luxury stores. We have a selection of colors ranging from natural wood, walnut and black which are paired with a silver or brass hook. Wooden Top hangers should be your choice if you are displaying jackets, dresses and shirts. Wooden Hangers are much sturdier then flimsy Plastic or Wire Hangers. For more formal clothing, we would recommend Wooden Suit Hangers because of its quality and craftsmanship. American Retail Supply can even customize the hangers in bulk with your business logo to give a more personalized touch! 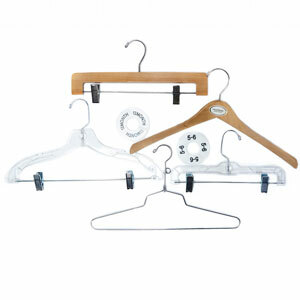 Are you looking for affordable bulk hangers for your clothes? Swivel Plastic Hangers are the most common type of hanger used in retail stores today. They are light weight and inexpensive for the wallet. Feature these black, white, and clear hangers in your store. Plastic hangers come with a metal swivel hook that makes displaying your clothing in either direction a breeze. Plastic hangers can look sleek and modern and timeless; suitable for most retail stores. Do you sell clothing that are more delicate? We would recommend our wooden hangers, but our swivel plastic hangers are on the affordable side while not damaging the fabric. We offer multiple types of hangers for different age groups like Children Hangers and Suit Hanger. Plastic top hangers have a molded notch on the left and right side to hold garment straps, preventing dresses and tank tops from sliding off. If you have noticed that plastic hangers keep breaking, you should think about buying a stronger hanger like Super Heavy Duty, Heavy Duty and Medium Hangers! The sturdiest and highest quality hangers that we have in store are our Chrome Hangers. Chrome Hangers are rare in retail stores and more often used by salesmanâ€™s selling garments. These hangers are meant to be paired with the Navy-Blue Salesman Garment Bag. The salesmanâ€™s garment bag wraps around the top of the chrome hangers and helps hold the garments in place while traveling around trying to sell merchandise to retail stores. The unique curved design of the chrome hanger is functional and a great option if you are going for an industrial/modern feel. Available in sizes from 12", 14", 16", and 18". Chrome Hangers is fantastic in your store for shirts, pants and dresses. American Retail Supply sells Chrome Hangers individually, so you are not tied to a whole case. Whether you are using Wooden Hangers or Plastic Hanger all hangers can use Accessories. Consider hanger sizers or dividers to organize your garments. Other accessories preserve and protect your clothes from damage like our foam strips or covers. Do all those unused hangers drive you crazy if so check out our Hanger Storage System, Hanger Caddy Rack and Hangers Stacker helps keep you organized. Ever had that garment that you couldnâ€™t reach if so donâ€™t forget to look at the Hanger Retriever to help you grab those hard to reach items. Sizers and Dividers play a big role in organization. There are a variety of choices from round, rectangle and markers. The round/rectangle sizers are placed on a rack to separate different sizes of clothing. Dividers come white with black writing. They come in a large variety of sizes ranging from 0-36, S-XXXL and blank. Hanger Markers are the item that attaches to the top of a hanger to tell you the size of the clothing item on the hanger. Hanger Markers come in the option of regular size or mini size. Hanger Markers are also white with black writing. Need help picking which hanger is just right for you, call American Retail Supply and one of our product experts can help you find just what you need. Call 1-800-426-5708 to know about buying bulk hangers for your business.